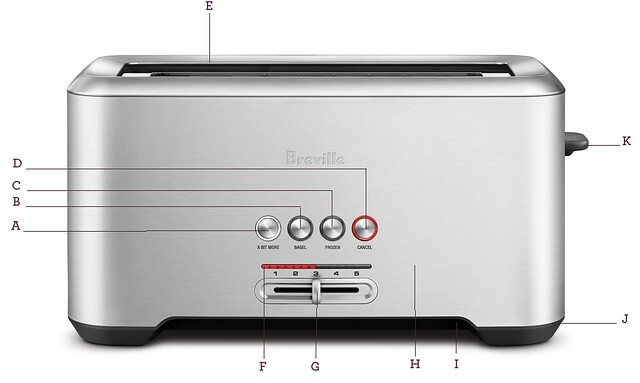 the Bit More™ Long Slot Toaster – - How do you perfectly toast any slice no matter what the type of bread? 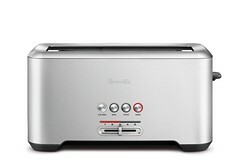 Add an extra 30 seconds for, well…that little bit more with the Breville® Bit More™ Long Slot Toaster. And with the Lift & Look® feature, you can check on the progress without interrupting the toasting cycle. A. A BIT MORE® Button. B. BAGEL Button. C. FROZEN Button. D. CANCEL Button. E. Toasting Slots. F. LED Toasting Progress Indicator. G. Variable Browning Control Slide. H. Full Stainless Steel Body. I. Slide Out Crumb Tray. J. Concealed Cord Storage. K. LIFT & LOOK®/High Lift Lever. L. Not Shown Breville Assist™ Plug.